How can I improve my teaching? Use peer-to-peer lesson practice to transform your instruction. 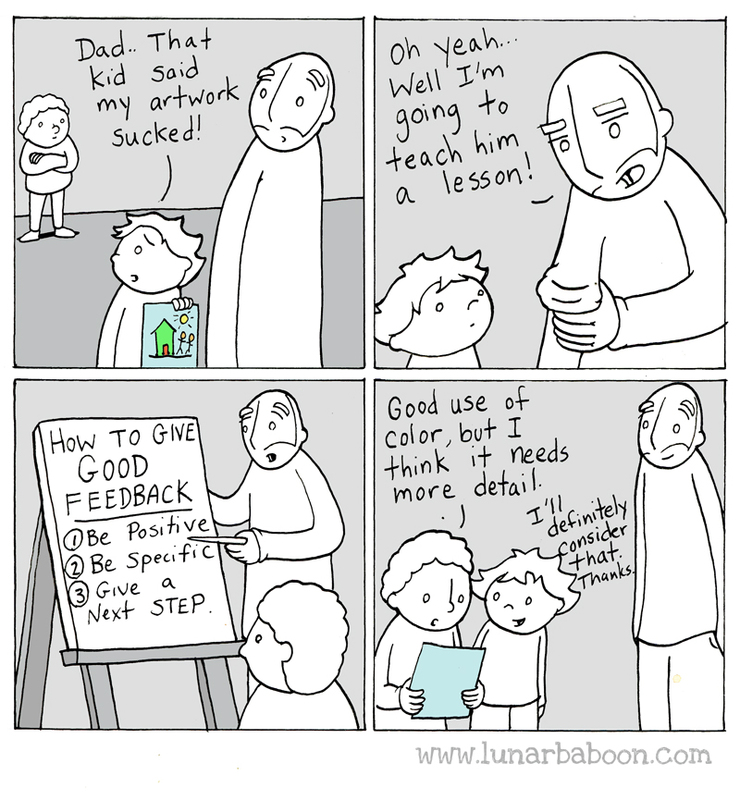 Give thoughtful and useful feedback. Incorporate feedback into your teaching practices. So far, we’ve focused on how we can be effective instructors in helping our learners develop computational skills. We’ve seen that providing opportunities for practice and giving useful feedback to learners are essential components in the learning process. Learning to teach is no different. Instructors develop teaching skill over time through practice and improve most when given feedback on their performance from other instructors who share their pedagogical model. In this section, we’ll discuss how instructors improve their teaching and give you some opportunities to practice. Many people assume that teachers are born, not made. From politicians to researchers and teachers themselves, most reformers have designed systems to find and promote those who can teach and eliminate those who can’t. As Elizabeth Green describes in Building a Better Teacher, though, that assumption is wrong, which is why educational reforms based on it have repeatedly failed. In the 1980s and 90s, an educational psychologist named James Stigler observed teachers in the US and Japan. In the OECD’s annual rankings of countries’ educational achievements, Japanese students routinely test near the top in reading, math and science, while American students rank at or below average. Looking at differences in teaching methods, Stigler found that American teachers met at most once a year to exchange ideas about teaching, compared to the weekly or even daily meetings of Japanese teachers. During these meetings, teachers in the US described their lessons to each other, but they did not observe each others’ teaching in practice. In contrast, Japanese teachers regularly conducted lesson study: observing each other at work, discussing the lesson afterward, and studying curriculum materials with their colleagues. Closely observing work in this way in order to improve it is commonplace in sports and music. A professional musician, for example, will dissect half a dozen different recordings of “Body and Soul” or “Smells Like Teen Spirit” before performing it. They would also expect to get feedback from fellow musicians during practice and after performances. But this kind of feedback isn’t part of teaching culture in English-language school systems: in the US, Canada, the UK, Australia, and elsewhere, what happens in the classroom stays in the classroom. Teachers don’t watch each other’s lessons on a regular basis, so they can’t borrow each other’s good ideas. The result is that every teacher has to invent teaching on their own. They may get lesson plans and assignments from colleagues, the school board, a textbook publisher, or the Internet, but each teacher has to figure out on their own how to combine that with the theory they’ve learned in their educational programs to deliver an actual lesson in an actual classroom for actual learners. When teachers don’t observe each other teaching, the tricks and techniques that each instructor has painstakingly incorporated into their practice don’t have the opportunity to spread, limiting forward momentum on system-wide improvements to teaching. Several research studies (in 2007, 2012, and 2015) have shown that teachers don’t adopt instructional practices based on reports about the effectiveness of those practices. Social norms, institutional culture, and lack of time and support prevent many teachers from moving out of their accustomed teaching habits. Change in teaching doesn’t come about through reading about new teaching practices, but by seeing these practices in action, practicing them and getting feedback from other instructors. The Carpentries pedagogical model supports lesson study by providing many opportunities for our instructors to learn from each other. In this training workshop, you will have opportunities to practice teaching for one another and to give each other feedback, you’ll also have the opportunity to practice in front of an experienced instructor as part of your instructor training checkout. In addition, Carpentries instructors always teach in pairs (or more), giving you the opportunity to learn by observing and to get feedback from your fellow instructors. We’ll start by observing some examples of teaching and providing some feedback. Watch this example teaching video as a group and then give feedback on it. Put your feedback in the Etherpad. Organize your feedback along two axes: positive vs. negative and content (what was said) vs. presentation (how it was said). This exercise should take about 10 minutes. Now that you’ve had some practice observing teaching and giving feedback, let’s practice with each other. Split into groups of three. Individually, spend 5 minutes preparing to teach a 90-second segment of the lesson episode you chose before the start of the training course. Get together with your group and have each person teach their segment to the group, while one person records this (video and audio) using a cell phone or some other handheld device. Use a whiteboard or other visual aids if available (Note: Do not live code you lesson. There will be a chance to live code later.) Keep a strict time limit of 90 seconds per person. After the first person finishes, rotate roles (they become the videographer, the audience becomes the instructor, the person who was recording becomes the audience) and then rotate roles again. After everyone in the group of three has finished teaching, watch the videos as a group. Everyone gives feedback on all three videos, i.e., people give feedback on themselves as well as on others. After everyone has given feedback on all of the videos, return to the main group and put everyone’s feedback about you into the Etherpad. Distributed trainings: Your Trainer will split the group into virtual break-out rooms. Follow the instructions above but do not record each other. Instead, give each person feedback immediately after they finish their turn teaching. This exercise should take about 25 minutes. 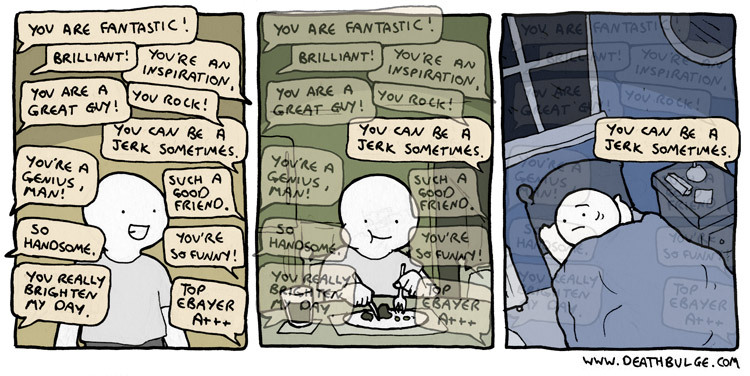 Sometimes it can be hard to receive feedback, especially negative feedback. Feedback is most effective when the people involved share ground rules and expectations. In Carpentries teaching, we use the 2x2 paradigm for feedback. Each person giving feedback is expected to provide at least one piece of negative and one piece of positive feedback each for content and delivery. This helps overcome two common tendencies when giving feedback on teaching: to focus on the content (even though delivery is at least as important) and to either provide only negative or only positive feedback. Initiate feedback. It’s better to ask for feedback than to receive it unwillingly. Specific feedback like this is more useful than a generic “That was great!” or “That was terrible!” Also, writing your own feedback questions allows you to frame feedback in a way that is helpful to you - the questions above reveal what didn’t work in your teaching, but read as professional suggestions rather than personal judgments. Communicate expectations. If your teaching feedback is taking the form of an observation (and you’re comfortable enough with the observer), tell that person how they can best communicate their feedback to you. Balance positive and negative feedback. Use a feedback translator. Have a fellow instructor (or other trusted person in the room) read over all the feedback and give an executive summary. It can be easier to hear “It sounds like most people are following, so you could speed up” than to read several notes all saying, “this is too slow” or “this is boring”. This is part of the reason for the Carpentries’ rule, “Never teach alone.” Having another instructor in the classroom saves your voice (it’s hard to talk for two days straight), but more importantly, it’s a chance for instructors to learn from one another and be a supportive voice in the room. Look at the positives along with the negatives. Giving good feedback is at least as important as knowing how to receive and process feedback. When giving feedback, stay positive, be specific and give your feedback recipient a clear next step to follow that will help them improve. Remember that giving and receiving feedback is a skill that requires practice, so don’t be frustrated if your feedback is rejected but try to think about why the recipient might not have been comfortable with the feedback you gave. Watch either this scipy tutorial (8:40) or this other tutorial (11:42). For each, give feedback following the 2x2 model. Put your feedback in the Etherpad. This exercise and discussion should take about 15 minutes. Look back at the feedback you received on your teaching in an earlier exercise. How do you feel about this feedback? Is it fair and reasonable? Do you agree with it? Identify at least one specific change you will make to your teaching based on this feedback. Describe your change in the Etherpad. Hopefully you were able to identify at least one helpful comment in the feedback you received and are able to use it to start (or continue) the process of improving your teaching. Remember, teaching is a skill that is learned. If you notice yourself feeling hurt or threatened by the feedback you got, or rejecting it as unfair or wrong, you may have a fixed mindset about teaching. By strengthening your growth mindset with respect to teaching, you can transform getting feedback from an unpleasant experience to a richly rewarding one. You’ll have more opportunities to practice teaching and to get and give feedback tomorrow. Skill Acquisition: What level are your teaching skills? As with computational skills, people have a tendency to think of teaching as something you are “just good at” or not. However, teaching is a skill, and expertise develops with attentive practice. Examine the descriptions of “novice,” “competent practitioner,” and “expert.” Where do you think you fall with regard to teaching? What have you learned about teaching? What are you aware of that you still need to learn? Discuss with a partner and then write some thoughts in the Etherpad. Like all other skills, good teaching requires practice and feedback. Lesson study is essential to transferring skills among teachers. Feedback is most effective when those involved share ground rules and expectations.